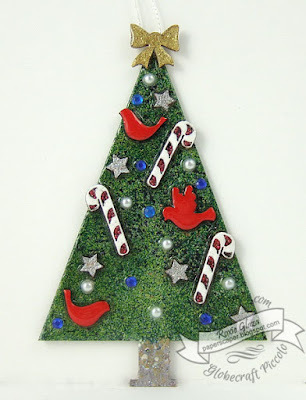 It's never too early to think about Christmas especially when you're making the items yourself so I (Roxie) have two Christmas trees to show you which were created with Globecraft and Piccolo supplies. For both trees the Glastique Gloss Finishing Glaze 1 oz. was used to stick the shapes to the embossed base then the entire base was covered with the same glaze which became an adhesive to hold it all together. Tree one is an ornament that hangs and 2 is a refrigerator magnet. I hope you enjoyed a little Christmas in May!